Today is a wonderful, beautiful day! It is much warmer, we are having April showers, and the sun is fighting the rain to create small windows of time allowing me to take photos outdoors at Sasha Shangri-La. Faith is a favorite of mine. She is an English production girl made in 1968. 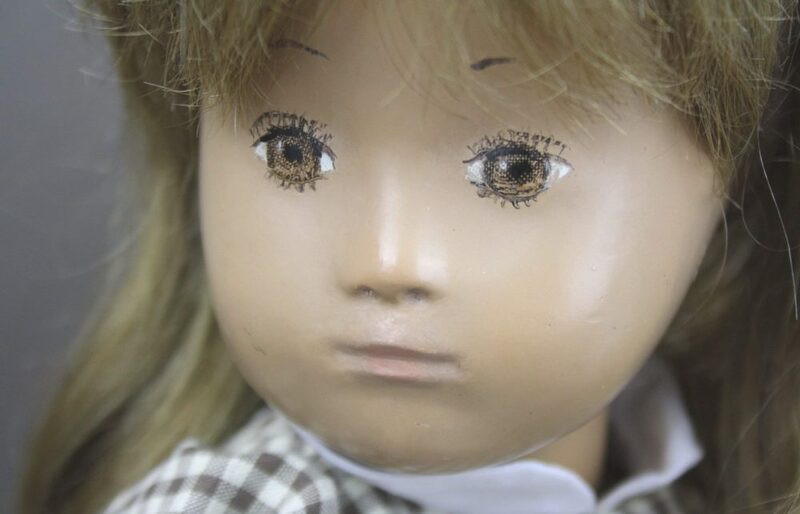 She has a single row of fringe and very beautiful, hand painted eyes. Faith put on her cheery Cath Kidston poncho with hood, her wellies and her bright yellow umbrella outdoors to enjoy the day. I took several photos of Faith from different angles and with her hood up and down. She is venturing out on our hillside. Faith standing with the front barn shown in the distance. Another photo showing her wellies that she loves wearing on wet days. You can see the flowers that have fallen from the redbud tree. A nice photo showing her umbrella. It felt so good to be outside today to take photos. Apple blossoms have also fallen nearby. The air feels so clean and crisp on our faces. Close up photo of Faith. This photo shows the back of Faith’s poncho with its Cath Kidston label. The poncho is also nicely tagged on the inside “Just for Sasha by Christina Meatyard”. I was so fortunate to find this on Shelly’s site. I love this fabric and the creation by Christina. So very well done! Lovely post of the beautiful Faith enjoying the spring showers. Sweet to see her in the pretty poncho which is ideal for keeping her dry. Looks like she is having a lot of fun in the puddles. Faith is a lovely girl and seems not to mind the rain a bit in her doughty rain gear. Your Mom must have been a very special person to produce a wonderful and loving daughter in you, Ginger. I imagine that you were two peas in a pod. Thank you for the heartwarming post. Love your post pics and Faith and her poncho! I remember wanting one when Chris made her first and hope she makes more. MOST of all I love the way you describe the air and also your Mother. I have the same sentiments and my Mum bought me my first Sasha and continued to collect and support me with little things for them and used to laugh that they always were with me throughout my life. I miss her terribly and it will be 7 years in October that she is gone from us. But our love and memories and joy in life live on!! Oh thank you Sarah. You are so right about our love, joy and memories that live on. How very special that your Mum bought you your first Sasha and what happy memories you now have! Faith obviously enjoys, just like real-life kids, walking through the long wet grass in her little ‘Wellies’ and colourful and waterproof Cath Kidston cape and then finally having a bit of a splash about in some shallow puddles left behind after the April Showers. Many thanks for the week ahead’s good wishes. A very pretty girl and her lovely poncho! I love Cath Kidston things, the fabrics are always so attractive! So a great idea of Christinas to make a rain poncho for a Sasha. I’m glad you were able to snap it up as it’s perfect with the umbrella for your sweet little girl. Doesn’t the rain make for great photos, everything looks so crisp and green! Have a lovely weekend Ginger! We really dodged the rain drops that day Sharon. But after several attempts, we were able to get a few photos of Faith and managed not to get us too wet :). Great post on Faith in her new Cath Kidson Poncho, she looks so sweet and it’s a great item to have for the rainy days.